Heat oven to 425°F. Line cookie sheet with cooking parchment paper. In large bowl, stir Bisquick mix, milk, sour cream, granulated sugar and orange peel until soft dough forms. On surface sprinkled with additional Bisquick mix, knead dough 5 times. Roll dough into 16x12-inch rectangle, about 1/4 inch thick. Spread 2/3 cup of the jam over dough to within 1 inch of edges. Starting with 12-inch side, roll up tightly. Pinch edges to seal. With sharp knife, cut dough into 8 slices. Place slices, cut sides down, on cookie sheet. Bake 15 to 16 minutes or until golden brown. In small bowl, mix powdered sugar and whipping cream until smooth. In small microwavable bowl, microwave remaining 1/3 cup jam uncovered on High 10 to 20 seconds or until melted. Spoon melted jam on top of jam spirals. 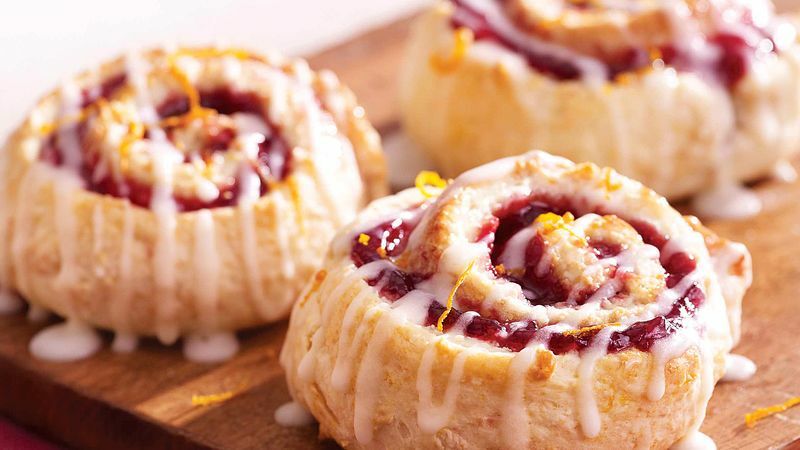 Drizzle glaze over jam. Serve warm.